There are 3 Levels of Practice that guitar players must know how to use in order to achieve their full potential on guitar. They are Microscopic Practice, Assimilating, and Shaping. I have covered in detail these 3 levels, or aspects of practice in Chapter 5 of “The Principles Of Correct Practice For Guitar”. The first two levels are where we use specific procedures for teaching the fingers how to make the movements required to produce the notes we need. All technical problems are worked out in these two levels, and the music is “input” into the mind and body, at least as far as the mechanical process of playing the music goes. However, the goal of all our practice is to go beyond the mechanical aspect of playing, and to put our mastery of the physical aspect of playing our music at the service of the ultimate goal: making music, real music. That is the purpose of the 3rd level of practice, Shaping. We “play” the guitar…and you can’t play if you don’t know how to have fun!The subject of Fun is one of the most serious topics we can discuss. One of the greatest achievements of my lifetime has been the maintenance of the capacity for fun from early childhood. Another has been coming to an understanding of what Fun is. And so, Fun is the cornerstone of my life, and the foundation of everything I do. I know that I am sometimes perceived as a serious person, talking about Principles and other not-so-fun topics, but when you know what Fun is, then you will see why even serious, or thought inducing, weighty matters can be Fun.I want to talk about this subject because it is vital to making progress as a guitarist. The fact is that anything can be Fun for some person or the other. However, the particular things that we find to be Fun say everything about who we are as people, and what our level of personal development is. However, there is one common denominator that is always present when a person says “this is fun”. That common denominator is “creative enjoyment”. Fun is creative enjoyment. Einstein working out the theory of relativity, or Michael Jordan shooting a basket; both are having Fun. Both are “creatively enjoying”. As long as this quality is present, anything can be fun. Without this quality, nothing is fun.What is “creative enjoyment”? Well, “creative” is almost self-explanatory. It is basically bringing something new into the world. It could be a dinner, an idea, a blanket, a building, whatever. Whatever is being created, it involves bringing something “out” of yourself, and giving it some kind of form on the outside.The universal human urge to be creative stems from the one characteristic that always accompanies a creative act: a pleasurable energy sensation in the inner being. The person who knows how to have Fun is the person who knows how to be good to themselves, how to give themselves pleasure, how to make themselves happy. Enjoying JoyAnd enjoyment? That is a very interesting word. “En-Joy”. According to the dictionary, “en” means “to put into”. Now, this is a very key understanding. People usually think that things are enjoyable in and of themselves, as if “joy” positively radiates from various things, and we merely have to bask in the “joy” that shines out of them like sunlight. A new car, a million dollars: wow, what happiness, what joy! And yet, we often read of millionaires with lots of money and fleets of cars, who kill themselves after falling deeply into despair and misery for one reason or another. So, obviously, there is no “joy” emanating out of any of these exalted “things”.When we en-joy something, it is because of what we are putting INTO it, not what we are getting OUT of it. “It” has nothing to give us, until we give “it”, us! What we put into it is the Joy that is already inside of us! Well, obviously, you must already HAVE this Joy inside of you before you can put it into something. That Joy is the native Joy of simply being alive, simply existing, along with everything else. We would all do well to check up on our personal “Joy Quotient”. If it is low, or missing entirely, we should find out where it went. We won’t find it gone to anywhere outside of us, only buried, perhaps smothered, deep within.Someone who has nothing they enjoy, simply is empty inside. The reasons why this happens would require other essays, but understand that an artist MUST have an inner fullness that is brought out, and combined with “the world” in a creative way, and VOILA, art appears. Music is written and played and sung, because someone has the capacity for “creative enjoyment”, for FUN.As we go from child to adult, the particular things we find to be Fun will change, and be added to. However, the intensity of that Fun, and the ability to have it, should never diminish. Unfortunately, it almost always does. There is no sadder sight to my eyes than the disconsolate child, moping and moaning “I’m bored, there’s nothing to do”. This poor child is already old, the spark has left, the inner fullness has turned to emptiness, and that emptiness is projected outward, so that the world, full of so much beauty and amazement, looks empty.No, the opposite of Fun is not work, it is boredom, which is “apathy for existence”.Turn Work Into FunIt can truly be said that the passage from childhood to adulthood, when properly traversed, is characterized by the ability to transform Fun into Work. The only difference between Fun and Work is that Fun is the creative enjoyment of an activity which has no goal other than the activity itself, and Work is activity that has a predetermined goal (Intention). That is why Work can be Fun, because Work is simply Fun with an added dimension. Work, like Fun, can be a form of creative enjoyment; it simply has a goal also. This is the difference between practicing and playing. Practicing is Work (Fun + Intention, or the goal to learn and improve), Playing is just plain Fun (we play because we want to play, it feels good). Fun has no structure imposed upon it from outside, Work has an imposed structure, that is why it is more “adult”.The properly developed adult should feel both a need for Fun and a need for Work. For myself, I am switching between the two all the time. Even sitting practicing, I may do some technical exercise for 15 minutes, with intense focus and concentration, and then, I will feel the great urge to just PLAY something and have Fun. Which I do. Sometimes, I just feel the need to play for half an hour. Sometimes, I feel the need to Work for an hour. One feeds into, and leads into, the other.Two Types Of StudentsThere are two types of students: one needs to learn how to have fun at Work, and the other needs to learn how to have fun at play. The first is more common. Many of us have never learned true Work. For me, my first taste of “work” was homework, a most distasteful intrusion upon my personal time and energy. I merely resented this demand to focus my inner resources upon something to which I had no connection, and no desire for connection.Fortunately, when I discovered the guitar, everything took care of itself, work and play became one thing, and both were infused with a spirit of enjoyment and fun. You can fake your homework ( I usually did!). You can’t fake your guitar practice, and you sure can’t fake your guitar playing!I will occasionally get the type of student who is happy to practice exercises with the metronome all day, focusing on those fingers for hours all day, every day. However, they never pick up the guitar to just play and have Fun! How sad, how tragic! That is not how we get to be guitar players or musicians. Musicians specialize in having Fun. We are Fun Masters. I have to tell these people “ I am ordering you, as part of your practice, to just pick up the guitar, play it, and have Fun! Remember, have Fun, that’s an order!”Other students only want to “play and have fun”. However, without some amount of work, without some amount of energy dedicatd to a goal of developing and improving our abilities, we soon find that playing the guitar is not much fun. It really isn’t fun to play the guitar badly and never get any better. Don’t Wait For FunOften, beginners on guitar delay having Fun, putting it off until some time in the distant future when they deserve it. This is not good. Fun, and music making should come into the picture as soon as possible. Anyone just learning to play should have two goals in mind: one, making sure the technical foundation being laid is correct, and strong so that continuous growth is possible, and two, making some MUSIC as soon as possible, something, anything that that turns you on, that gets your emotional juices flowing, whether it is Bach or Rock.Yes, anything worth doing should be worth having Fun while doing it. The United States Marines live by a Principle, their motto, “Semper Fi”, which means “always faithful”. Here at GuitarPrinciples, we also live by a Principle that covers Business, Work, Life and Gutiar: Semper Fun! What did you think? I’d love to know your thoughts on this article, please leave a comment. Why do we play music? What is the root, the fundamental thing we are really doing when we play and practice music? We play music because a great desire has been awakened in us; and that great desire is to become the music. It is this desire, which for some is a mild prompting to explore such a possibility, and for others an overwhelming urge and need to possess completely the ability to become the music, that makes us pick up our instrument to practice and play. Fundamentally, when we practice and play, we are in the process of becoming the music. The world needs such individuals, who devote themselves to becoming music, because the world needs music. It must have it, there is no doubt about it. And so, being devoted to developing ourselves as worthy to become our music so that we may offer it to the world, it is important to understand what we are really doing, or perhaps what we should be doing, so that we may really, and completely, become the music. We must understand the word "become". What is it to become anything? It is to "be", so that what we desire will "come". It is to so dispose ourselves that we create the conditions, inside and outside, for something to come into being. That is what it is to "become" something. If I want to "become" a doctor, I have to do certain things so that the condition, in which I will be a doctor, will become a reality. So the things I must do are the things necessary for it to "come". So, in the process of becoming a doctor, you will see me do things like going to school, studying hard, and so forth. Similarly, there are certain things we do to become the music. The whole question, really, for musicians, is how to "be" so that the music is able to "come". For myself, I often learn the hard way. I have seen firsthand some of the ways you don't want to be if you want the music to come! I remember when I first started to perform. I was in the middle of a big concert, and I forgot the music! I was really mad, and totally embarrassed. I tried to start again from the beginning, but I hit this same spot and had a blank where the music was supposed to be! The reason was very simple: in my practice, I did not completely become that music. I had become it up to a point, but not far enough. I learned from that experience the importance of one particular aspect of becoming the music: becoming the music in a mental way, that is, knowing the music, note for note, consciously and clearly, so we could say the notes and fingers if need be. That is one of the aspects of becoming the music, one of the things we must do. The process of becoming the music begins with our oneness with the physical aspect of playing. That is why Principled Players understand two things: mis-handling of the physical aspect of playing is what effectively prevents most people from beginning the process of becoming the music, and the continued development of awareness in this area is a mandatory part of creating vertical growth in our playing, regardless of our stage of development. When we practice, the music itself is imprinted into our bodies, that is why we sometimes say "I have this piece of music in my fingers now". It is repetition, with focus, that imprints the music into our bodies, that enables us to "become the music" on a physical level. We usually call this "muscle memory", and there are pieces my body knows so well that, if I had another set of hands to type with, I could be playing them while I write this! The one area that does not vary, the one way in which we must become the music with the utmost fervor, no matter what style we play, no matter how simple or complex the music might be, is the emotional dimension of our involvement with the music. Our emotional connection to the music is the crux of the matter (still, as players, we must realize there can be no expression of the emotional connection until the physical connection is achieved). Our emotional connection to the music is what we are really communicating to people when we play, and that is what, ultimately, they want to receive when they receive our music. They want to know and experience their emotional selves, and that is done through another emotional self who is breathing life into the music. We cannot breathe life into the music when we play unless we have breathed the music into our beings when we practice. This is why I am always emphasizing the complete focus of attention during practice, focus on the physical, mental and emotional dimensions. The music exists first as a thought in our mind. This thought then unites with the desire and the emotional feeling for the music. At that moment, the music is literally "breathed into" the body. The energy taken in through the breath drawn with feeling for the music, is what brings the music into our bodies so that it may be given life, through the action of the muscles and bones of our body. This is the process of synthesis and synchronization that takes place as we become the music during practice and playing. This is why various dysfunctions of breathing, such as holding or constricting the breath, are so common with players, especially while playing whatever is most difficult for us. Fundamentally, problems in playing, and their continued existence, can be seen as a failure to properly breathe in the music. The music cannot be placed in our bodies without the synchronization process, mediated by the breath, that takes the thought and understanding of the music, and synthesizes it with the emotional feeling for the music, and results in the physical power to play the music. When we are able to do these things with the necessary intensity, and the body has been trained to make the movements in practice, the music plays itself. It is interesting and important to realize that we must, at times, experience and focus on the physical aspect of playing by itself, relating to the music in only a technical way, without emotion. Equally important, at other times we must relate to the music with only our emotional selves, with only a background awareness of the physical element of playing. There are also times we must measure our attention in different degrees to each while playing. Sometimes our music wants playing, sometimes practice. Great musicians devote their lives to becoming their music. They respond to the overwhelming love and desire for the music -the desire to hear it, think it, and feel their body make it. We should hunger for our music, and go to our instrument to satisfy that hunger. And we should feel a joy and a satisfaction when we do so. To feel this hunger is a special calling that we honor by giving all of the best of ourselves. As we do, we become the music more and ever more completely, always seeing something new, always feeling something new, always finding the deeper we go, the deeper it gets. What did you think? I'd love to know your thoughts on this article, please leave a comment. If you have been playing for a long time and you have just discovered “The Principles of Correct Practice For Guitar” and started working with the Foundation Exercises, you are probably starting to have a number of uncomfortable feelings. As you study “The Principles”, a new awareness will begin to dawn for you. This is good, but it can also have its bad aspects. Some people become so aware of body tension they have while playing, tension they previously ignored, they begin to think they are getting worse instead of better. They may even become afraid to practice! Some players are so aware of, and on their guard against, excess muscle tension, and the devastating effects for the developing player, they are afraid to touch a string! They start to feel like that song by Al Yankovich, “Everything You Know Is Wrong”. They realize that even though they may have been playing for 25 years, there are certain really fundamental things they have never known, and if they did know them from the beginning, everything would have gone differently for them in their growth as guitarists. Well, that IS the truth. That is the message I am always trying to get across. I am always trying to convey to people that if you have tried to learn the guitar and failed, it is not you, it is the approach you are using that is to blame. If you are stuck at a certain level of development, it is not you, it is how you practice that is keeping you there. Change the approach, and you will create different results. I know this is a fact, because I do it every day, for myself, and for others. 3. You can undo bad habits you have learned along the way. You can begin the process of undoing bad habits right away, when you begin to acquire the correct understandings, and use the approaches based on them. So, even though it is a shock to find out that you have had a bad or insufficient approach for years, you must get over that shock right away. In fact, get used to it, it’s only the beginning! Get used to feeling like an idiot, get used to feeling like a beginner. Staying with that feeling positions you in the best possible way for being able to see what YOUR obstacles to growth really are. As soon as you think you are “complete” in some way as a guitarist, you will be unable to see your own weak spots. How Should I Practice Now? Now that we have the proper attitude in focus, let’s talk about how to go about managing the process of changing bad playing habits. How do we actually conduct ourselves, and our practicing and playing? As I have said, some people become paralyzed, afraid to play, afraid of undoing work done in practice sessions by what they do when they play. And for those who play professionally, it is of course, absolutely necessary that they continue to play, even if they are doing “remedial” work on their technique. ur personality and work ethic. Are you able to be very disciplined and work only on the foundation exercises from “The Principles”. This is often the smartest and shortest path. How much time do you have to practice? Can you work on the foundation exercises in a disciplined way for perhaps half your practice time, then go to other music? Are you performing? In that case, you must play your music even during the process of transforming your fingers. Another approach would be to take the Middle Path. This is the one I have chosen, and I will describe it for you. First, begin to do all the Foundation Exercises, because they will start to undo the foundation of ALL your bad habits. Do them every day for perhaps ten minutes at least, or anywhere up to half your available practice time. Second, as you practice, and come to an awareness of the existence of a “bad habit”, develop an understanding of HOW it got there. What weren’t you doing that allowed that situation to develop. Of course, it always reduces down to something you weren’t aware of that you should have been paying attention to, and paid more intense attention to during practice. An example would be a finger sticking up in the air while another is playing. Third, absolutely spend a good amount of time in practicing reversing that habit. Practice in a new way, where you make sure you do what you weren’t doing before. Analyze the essence of that bad habit, extract it from it’s musical context, and perhaps make up “auxiliary exercises” based on the essence of it. Use all the practice techniques that I teach (in “The Principles” and in “Beyond The Basic Practice Approach”) to effectively begin this process of reversal. Fourth, make sure the reversal of the habit is actually beginning to take place. This means we make sure that our practice is effective. If it’s not, go back to steps One and Two and Three! Fifth, take up one of your usual pieces of music where that habit has been showing itself by producing unwanted results, and begin to practice it in the same careful way that you did the exercises you were using to change the essence of the bad habit. As weeks and months go by, your old “bad habit” will begin to weaken, it will change. It will be replaced by the new finger action you are training into the fingers. The important point to realize is that the new habit will take over, if you are doing the proper proportion of correct practice on the bad habit. Merely playing the music where the bad habit displays itself will not disturb the changes you are building into the fingers by your powerful, correct practice. As time goes by, the new habit will begin to show itself in your playing, and become stronger and stronger. 1. I notice I have trouble with a fast scale passage in a piece I am playing. 2. I notice a particular note starts disappearing when I reach a certain speed. The note is being missed. 3. I notice the finger responsible for playing that note is the third finger. It is not getting to the note because it is going up in the air in reaction to the second finger being used right before it in that particular scale passage. In other words, it is tensing in reaction to the movement of its neighboring finger, and I have not been paying attention to it. I realize this is a bad habit that pervades my playing. I have a third finger that tenses up in reaction to the use of the second finger. 4. Now I know I have to work on something very fundamental. I have to work on the behavior of my third finger, and change the way it reacts to its neighbor, the second finger, being used. If I can get down to the matter with that degree of specificity, that degree of clarity and focus, I am in a position to cause major Vertical Growth. If I can change the way that finger is behaving in that situation, I will see many playing problems I am having in other pieces of music begin to “melt”, and eventually disappear. 5. I must find a way of practicing that movement that does not allow the bad action to occur. Principled Players know that means using Posing, No Tempo Practice, and the Basic Practice Approach, all done with the proper intense focus. Well, that is very simple. You are simply suffering from shoulder tension while making the moves (also, tension in the muscles of the upper back and chest, they all move the arm). Because of this, you must address the fundamental aspects mentioned before. You cannot control your fingers, or even train them, because control is being choked off higher up, in the larger muscles. Now, the challenge will be to be able to use the practice approaches that CAN actually change something like that. Users of “The Principles” know that this means Posing, and No Tempo practice, and the use of The Basic Practice Approach. Again, unfortunately, too often I meet readers of my book who are NOT really using these practice approaches. They bought the tool, but they don’t use it! Those that do, see the results. You must understand that your ability to effectively change bad habits is going to depend completely upon how deeply and truly you understand the fundamental mechanics of the process of playing the guitar, and the process of “practicing” the guitar, meaning the actual process of how we teach the mind and body new things. If you do not have a sufficiently deep understanding of these things, you will not be able to change bad habits. I hope you realize the importance of what I just said! I suggest you read it over a few times, and think about it. I suggest you take some serious time right now, and in the next days and weeks to size yourself up, and answer this question “Do I feel like I have a sufficient understanding of the mechanics of playing the guitar so that I know how to practice in a way that will “change bad habits”, which means “solve problems” which really means “fix bad things about my playing”. I am going through all this to really drive a point home to all the people with one of the “how can I change bad habits” type questions. You can’t, unless the level of your understanding of all aspects of the process is sufficiently deep! So make sure it is, and continue to deepen it. The way to do that is to educate yourself. The most important thing you can do to help yourself get better on guitar is to study “The Principles Of Correct Practice For Guitar”. After that, everything else you read will make so much more sense. You must also constantly think for yourself, experiment, observe, draw conclusions, and re-experiment in your practice. My Finger Just Does That! There is a statement that students will often exclaim, and it is a big tip-off that they do not have a sufficiently deep understanding of how to practice to change bad habits. That statement is, when referring to some bad behavior a finger may be exhibiting, “I can’t help it, my finger just does that”! This statement shows that the person is the unfortunate victim of the dynamics of the practice process, such as Muscle Memory, instead of being the master of those dynamics, in which case Muscle Memory is put to work for us, instead of against us. The person who has the necessary understanding makes the right thing happen because they can do two things: they can summon the strong Intention and Attention (mental focus) necessary to make the correct thing happen, and they can have the stillness of mind and body required to do real No Tempo Practice and Posing, which will erase old muscle memory and replace it with new, improved muscle memory. A strong mental focus, and the stillness of mind and body I am talking about, make your practice sufficiently deep, sufficiently powerful to change bad habits, or in fact, acquire good ones. I call this “the bottom of your practice”. If the bottom of your practice is not deep enough, your practice will have no effect. Essentially, most of what I do with students is simply to deepen the bottom of their practice for them, and try to get them to be able to keep it that deep for themselves. So, if you have that “it just happens” feeling, well, now you know what it really means, and what to do about it. Once you have begun to get this deep understanding, you will be able to take certain aspects of playing the guitar in their proper order. You are not going to address the issue of how your hands and fingers function until you have addressed the issue of something more fundamental, like how you sit with the instrument, and how aware you are of your body in general while playing. If you don’t know that the way you are sitting and positioning your arms is forcing you to tense muscles needed to play, you will always be working with a handicap that limits your progress. The remedy here is to constantly examine the fundamentals of your playing. Your sitting, hand positions, finger action, pick action, etc. Observe, think, analyze, experiment, repeat the process in every practice session. Never take the fundamentals for granted, they are the key to excellence. When the fundamentals of guitar practice are in place, you can begin to get specific about the other elements of playing technique. Whatever level of player you are, begin to get a clear focus on your weak areas, and be specific. Now it is just a matter of continuing the process, and setting one goal after another. When you work on a fundamental, such as the one described above, you make it a project that may last anywhere from a month, to several months, or even a year. You hammer at that aspect of your technique relentlessly. You do whatever exercises you know that will help, if properly practiced. You make up exercises that will help, if properly practiced. You use the actual passage that gave rise to the whole “investigation”. You take note of and measure your progress and results. Once you see that bad habit begin to weaken, and new habits come through in your playing, you ask yourself, “Ok, what is the next worst thing about my playing, what is the next fundamental aspect of playing that is underlying various trouble spots in my repertoire”. Find it, and go after it. They don’t get upset when they discover some major flaw in their playing, they become curious and interested. They become excited and energized by the challenge. Whenever I have one of my “wow, what an idiot I’ve been” moments, I am always very happy. Now I know I am on the verge of becoming an even better player than I am now. How could that upset me!?? And this is something all of you can say at such times. Make sure you do. Make sure you keep the feeling of excitement and gratitude if you read something, by me or someone else, and it makes you realize that you have been missing something in your understanding and approach to the guitar. 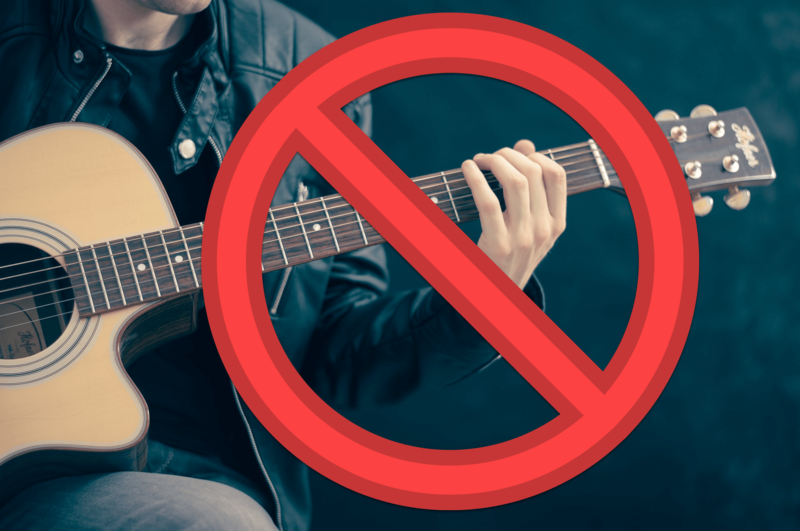 Do not get whinny and negative because something has come along to upset the nice opinion you have managed to create and maintain about yourself as a guitarist! And make sure you maintain that attitude of excitement, discovery and gratitude every day on your path of development as a guitarist, musician and artist. It is an endless journey, and those who have gone farthest know that best.